When I work with couples in my counseling practice, time and time again, I see one or both struggle with some kind of anxiety, depression or other mental health disorder. While not a deal breaker by any means, unresolved mental health problems can lie at the heart of couples’ greatest friction and disconnection. Lack of awareness or practical tools leave many ill-equipped to support one another and navigate the tumultuous road of mental well being, both individually and as partners. Just last Tuesday, Prince Harry, Prince William, and Kate Middleton gave an inspirational speech in the UK to promote their mental health charity, Heads Together. Reaching into the American tabloids, any step toward breaking the stigma and normalizing mental struggles is a great one. Of particular importance is to openly talk about how to better prepare spouses and significant others to provide a healthy and balanced support system. Here are a few things to keep in mind regarding mental well being — for your partner who struggles, for you as their mate, and for the health and strength of your relationship. 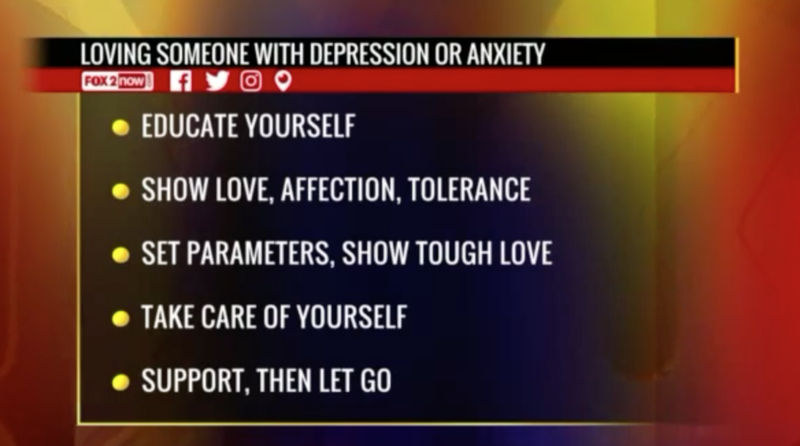 Note: You might find many of these tips relevant for your relationship with a friend or family member as well. Click above for Dr. Glik with Fox2 on this topic. Knowledge is power! We so easily judge and misunderstand external behavior, especially when it comes to mental challenges. Take someone with OCD (obsessive compulsive disorder) who cannot seem to control their reactivity or need to control you; or a mate in a deep darkness who can’t get out of bed; or a bipolar loved one whose unexpected rage creates a ‘walking on eggshells’ environment. Meeting with a mental health professional can be enlightening — to understand your partners’ behavior and limitations, to learn how to be keep perspective and offer help. While each individual must be accountable for their behavior and their growth, gaining greater awareness can give essential insight lest we will lack compassion and take another’s condition and behavior personally. True love can be seen by the love we show when someone seems quite unlovable. Try to remember and see the good within your partner. Remember, they are not their behavior or illness. Don’t fall into the illusion of their outer shell acting crazy-like, out of control, withdrawn and/or certainly foreign to the person you fell in love with. Remember and love who they really are. While we want to grow our degree of true and unconditional love, this does not mean we should accept any ‘ole toxic environment and behavior. Unconditional love doesn’t mean unconditional environment. Be patient, yes, and give leeway for your mate to get help and grow. We don’t want to leave our loved ones when they are down. However, be mindful of where you might be enabling and not keeping him/her accountable. Set good boundaries for your needs and happiness — not necessarily “all better tomorrow” demands, but simple actions steps you deem important for your partner to become healthier. Both of you need to be happy in the long term, and we all deserve someone who is taking care of their health. Life and relationships are hard enough under the best conditions. Living with a spouse who has some kind of mental illness can add even greater stress as well as emotional and physical demands. It’s tempting to get drawn in and make it all about him (or her). Be on the watch for putting your own emotional, physical and spiritual needs on hold. Eventually, this backfires and actually makes you less able to be the supportive person you want to be. Journal and listen to the quiet within. Give yourself the freedom to express your emotions and struggles. Stay involved in what nurtures your soul. Exercise, make time for hobbies, grow in your career, reach out to friends, family, or a professional for support and guidance. Self-care is anything but selfish. Oftentimes, we live by patterns. If you're a fixer, then don't be surprised if you feel this urge with your mate who is struggling. Empaths and caretakers tend to attract people into their lives who seemingly need to be taken care of. When you find yourself feeling overwhelmed, check yourself and see if you’re trying to fix or control what might likely be bigger than you. Try observing rather than fixing. Check within and see where you might be afraid or where you don't trust the process of life. Look for your own growth and healing opportunity in this challenge. Remind yourself that what your loved one is going through, or behaving like, is their movie. Yes, you are a player in their movie. But your movie, your individual relationship with your self and your life — this is the only movie for you to direct. It's easy to get caught up in the heaviness and serious work to be done when it comes to mental well being. That being said, step aside, lighten up and make special effort to inject joy and positivity into the relationship. Keep dating, talking, sharing, admiring, appreciating, saying “I love you”, checking in during the day, enjoying your kids and friends. Don’t let the mental illness consume other goodness and blessings you share. ‘Bubble it’ as I like to say. Carve time out with permission to not focus on any challenges. If you’re committed to your relationship, as best you can navigate this challenge Together. Go to counseling Together, check in and communicate openly Together. This might sound contradictory to the wisdom about letting go. It’s about being in two places at one time. When it comes to the health and connection in your relationship, the more you can communicate openly, at times when you're neutral and calm, how you each are feeling and dealing with the mental health challenge, with really listening to each other, then you will inject a beautiful unity and peace along the way.